Jacqueline Joyner-Kersee was born on March 3, 1962, in East St. Louis, Illinois. As a teen, she won the National Junior Pentathlon championships four years in a row, and received widespread honors in high school in various sports, including track, basketball and volleyball. Joyner-Kersee thrived as a basketball and track-and-field star, however, and during her junior year, she set the Illinois high-school long jump record for women, with a 6.68-meter jump. Joyner-Kersee attended the University of California, Los Angeles on a full scholarship, and continued to gain fame on both the court and field. However, in 1981, at the age of 19, she began to focus on training for the Olympics, specifically for the heptathlon. She later graduated from UCLA in 1985. Competing in her first Olympics, in Los Angeles, Joyner-Kersee earned a silver medal in the heptathlon, a seven-event competition that includes the 200-meter run, 800-meter run and 100-meter hurdles. Building on her impressive showing at the 1986 Goodwill Games, Joyner-Kersee made a splash at the Seoul Games by accumulating a record 7,291 points in the heptathlon to win gold. Additionally, she became the first American woman to win gold in the long jump. 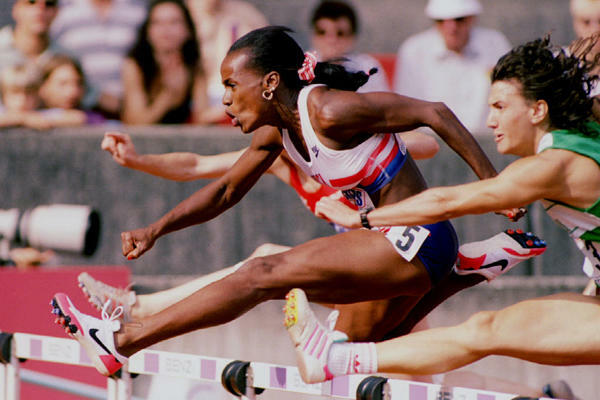 With her successful follow-up at the 1992 Barcelona Games, Joyner-Kersee became the first woman to win consecutive Olympic gold medals in the heptathlon. She added a bronze in the long jump. Joyner-Kersee's last Olympic run came in 1996, when she took home another bronze medal in the long jump at the Summer Games in Atlanta, Georgia. She did not compete in the heptathlon that year due to a pulled hamstring. Along with her Olympic triumphs, Joyner-Kersee won four gold medals at the World Championships. She claimed the national heptathlon championship eight times and the national long jump title nine times, setting the American record with her leap of 24 feet, 7 inches in 1994. Joyner-Kersee also thrived in the hurdles, setting national records at distances of 50, 55 and 60 meters. After announcing her retirement from track in the summer of 1998, Joyner-Kersee briefly attempted a career as a professional basketball player. She soon came out of retirement with the goal of making the U.S. Olympic team for the fifth time, but fell short at the 2000 Olympic trials. In February 2001, she formally retired for good, at age 38.